Rothschild H. Holden House. 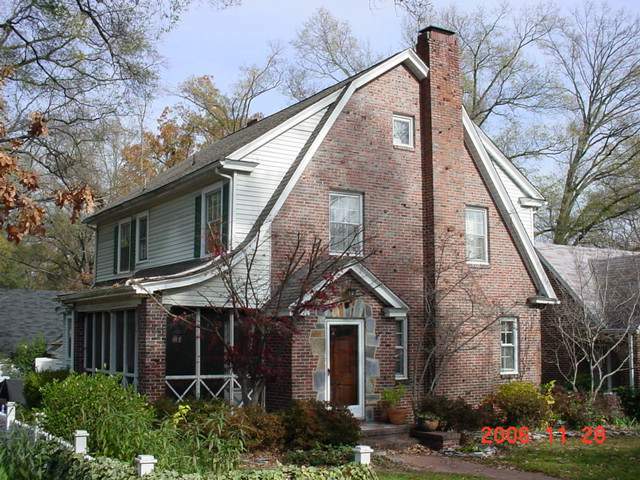 Brick 1 1/2 story Dutch Colonial Revival/Tudor Revival-style house. 4/4 sash windows, and an original side porch. The house was built between 1935 and 1937. Rothschild H. Holden, a dentist, was the owner-occupant in 1940. This house was most likely designed by george hackney, due the all the traits such as clinker brick, plaid tile in the bathrooms and it being close to his own house. Additions/modifications include aluminum siding and storm windows, original 2 car replaced with 3 car garage (grrr! ), rear addition (1950s to 1960s most likely) and the side porch was screened in.